Every food truck needs to have some kind of theme, gimmick, or unique idea in order to attract attention. 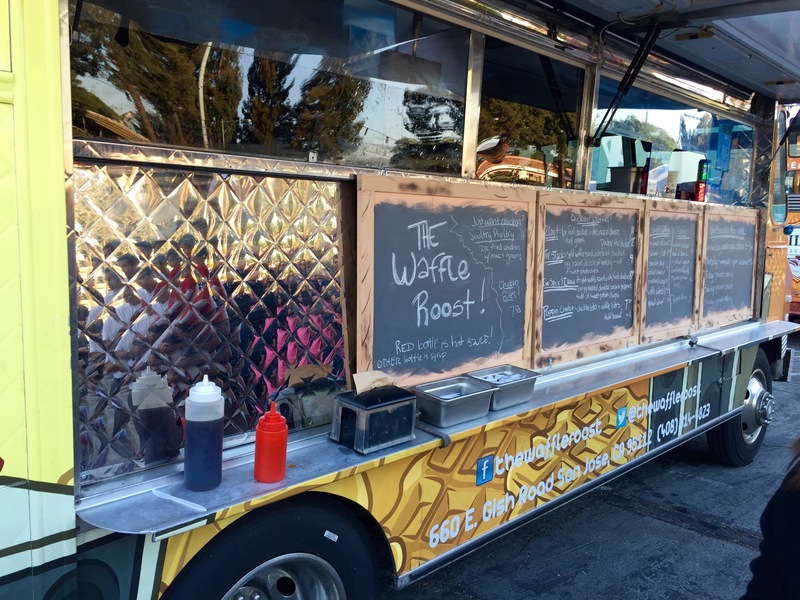 The Waffle Roost truck, as you might guess from the name, features chicken and waffles. While this isn’t a new or original idea, Waffle Roost just so happens to be the only one in the area serving up this deliciously weird combination. It’s one of those things that for whatever readon, just works. This chicken must have grown up in the East Bay. I made my way over to this particularly-easy-to-spot-in-a-crowd truck and ordered the 2 Legit, which includes four unique and delicious foods: fried chicken, a waffle, mac and cheese, and collard greens. The boneless white meat fried chicken was darn near perfect and had a wonderful, flavorful crust on it. It was perhaps just the tiniest bit dry, but I still give it high marks. The waffle surprised me; it wasn’t the typical fluffy Bisquik style thing you’d expect, but rather a satisfying, whole-wheat-ish masterpiece with a wonderful crunch. It was excellent. Please chicken, don’t hurt ’em. The mac was cheesy and awesome, and it had a scratch-made flavor to it. I was starting to become impressed at this point. Last up was the collard greens, which I was not looking forward to. I don’t like cooked greens of any kind, collard even less so. Well, in for a penny in for a pound, as they say. Here goes a big bite of disgusting greens. Hey. Now, wait a minute. Let me try that again. Wow. They’re.. good! But they’re greens. I’m confused. I don’t know how they did it, but the magicians at Waffle Roost somehow made a delicious food look exactly like collard greens. I actually ended up eating the whole serving, I liked them so much. This is the way they roll. 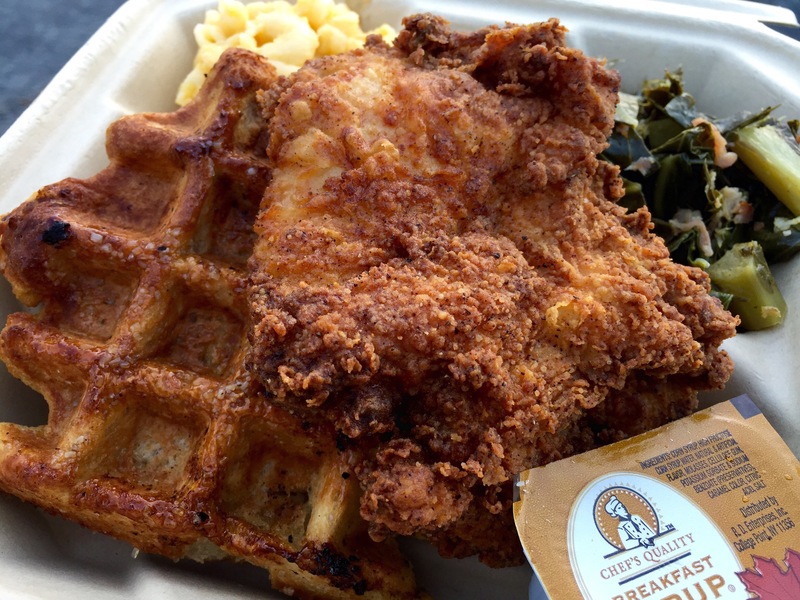 Waffle Roost is undoubtedly one of the better food trucks in the SF Bay Area. 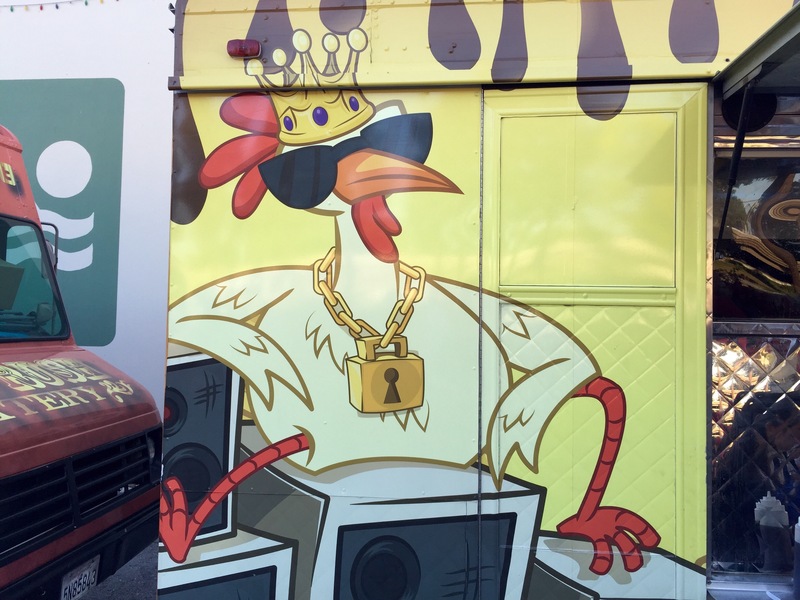 Solid execution from the kitchen combined with high quality ingredients have made this mobile eatery the go-to spot for chicken and waffles within a 100 mile radius. I rate them a generous 215 out of 237 individual serving containers of maple syrup, a very respectable score indeed. The next time I spot this truck on the road, I’m going to follow it to wherever it’s stopping next. There a lot of words to describe Mo’s, and most of them begin with ‘B’. There’s burgers, breakfast, beer, and, most of all, big. This new-ish joint in Campbell prides themselves on going large, but it’s not just the portions that are supersized. The creativity and quality of the food is outstanding, and any place that officially serves breakfast for dinner gets high marks in my book. 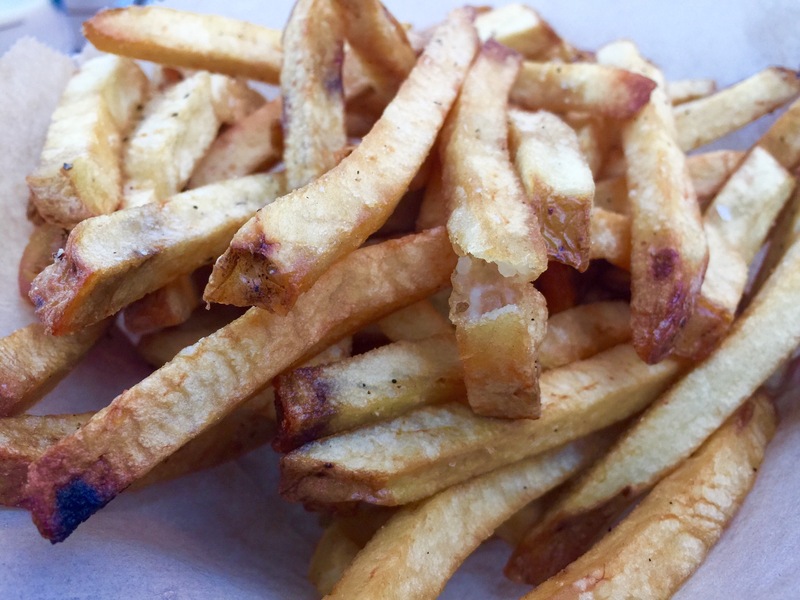 To get things started, here is a picture of some fries. Everyone likes fries. The evening started like any other, with me circling around downtown Campbell while muttering a steady stream of obscenities to no one in particular. After finally parking my car in a questionably legal spot, I headed down the block to meet up with my better half for dinner. Our eatery of choice for the evening, as you may have already guessed, was Mo’s. This self-proclaimed breakfast and burger joint is perched right in the middle of South Bay Hipster Central, aka East Campbell Avenue. Shawn and I secured a spot on Mo’s cozy patio and took a look through the menu. In addition to traditional burger and breakfast options, there are tons of crazy and awesome menu choices. Steak and egg tacos, colossal carrot cake waffles, and The French Connection (a breakfast “sammo” served on a baguette) are just a few examples of Mo’s wackier fare, and all of it is darned tasty. I opted for a Sriracha cheese melt and Shawn ordered… wait for it, the name is pure awesome… a mother cluckin’ waffle. This mother cluckin’ thing was mother cluckin’ tasty. What is a mother cluckin’ waffle you ask? It’s a “regular” cluckin’ waffle with Frosted Flakes added. Yep, those Frosted Flakes. Cereal. 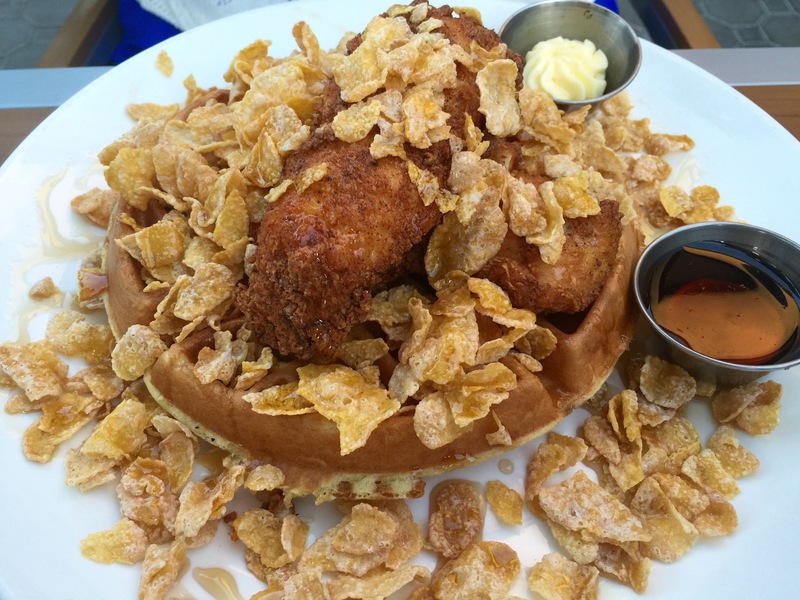 It’s a piece of fried chicken on a waffle and covered in cereal. (A very good piece of fried chicken, I might add, and a very good waffle.) The crazy bastards running the kitchen at Mo’s are officially out of their minds, and I love ’em for it. Keep up the good work guys and gals, you’ve got me grinning from ear to ear. This was one spicy sandwich. It still burns. I almost forgot about the Sriracha cheese melt. 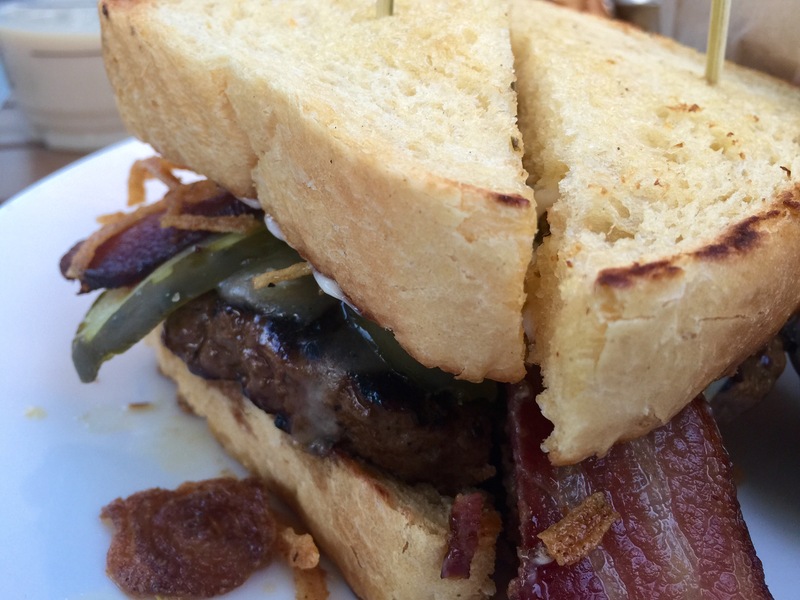 Like it sounds, it’s essentially a patty melt with Sriracha involved… in every possible way. There’s Sriracha pretty much everywhere, including in the ketchup and in the patty. It was fantastically delicious, and fantastically face-melting. If you don’t like hot stuff, stay far far away. If you enjoy hot stuff, you should still probably take a few steps back. If you LOVE hot stuff, brush your teeth with Tabasco sauce, and think ghost peppers are for weenies, then you should order the Sriracha cheese melt. It’s really, really incredibly good, but make sure you are prepared. It will set your nose hairs on fire, no joke. Simply put, Mo’s is my kind of place. This restaurant offers high quality comfort-style food with a creative twist, and that’s all I really need to say. This kind of eatery is my own personal holy grail, so of course I’m going to rate it highly. Looking at things objectively and without my own bias, however, it still gets a pretty good score. I rate Mo’s 140 out of 151 Frosted Flakes, which puts it squarely in the upper echelon of all restaurants in the Bay Area. Well done, Mo’s. Well done. I really can’t think of a good reason why you wouldn’t want to cure your own bacon. IT’S BACON, PEOPLE. More is better! Homemade is even better than that. So then, do you like maple bacon? Black pepper bacon? 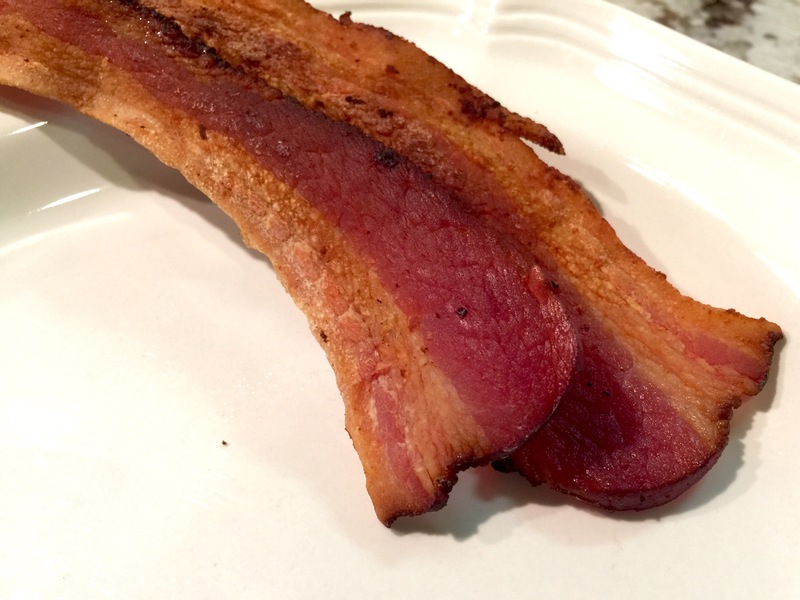 Fancy herb-spiced yuppie bacon? Do you prefer it sliced thin, thick, halfway in-between? Well guess what, you get to choose. Control your own bacon destiny! Ok, so perhaps you don’t own a smoker and that concerns you. Sure, a smoker makes the roasting/smoking process a little bit easier, but it isn’t a 100% requirement by a long shot. There are a lot of perfectly viable workarounds, so don’t worry too much about it. 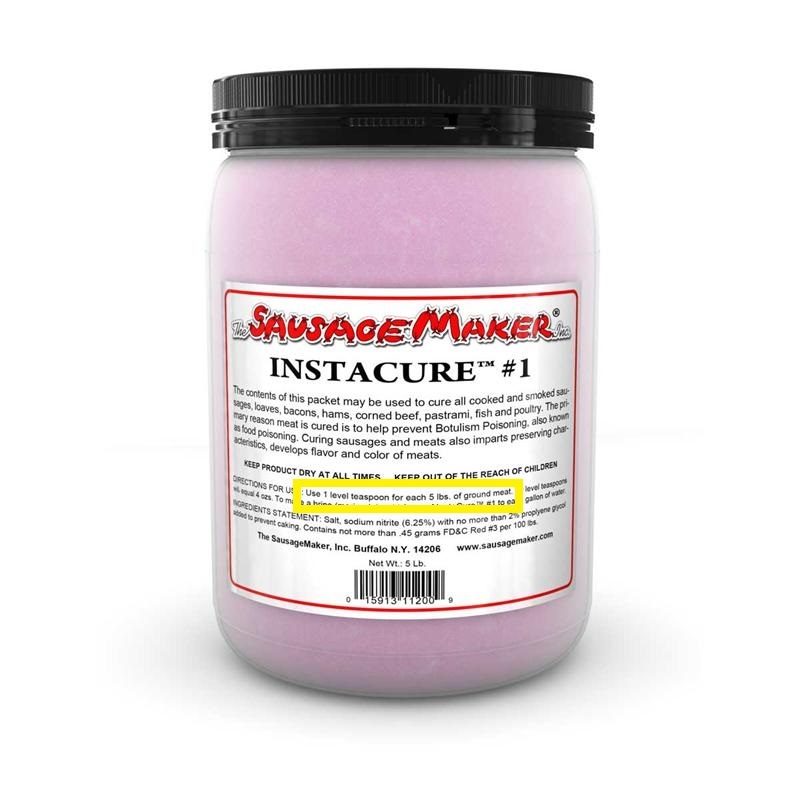 The only truly “specialty” item you’re going to need is curing salt, also known as “Prague powder #1“, “Instacure #1”, or “pink curing salt”. Himalayan pink salt is not the same thing as pink curing salt, so don’t confuse the two. 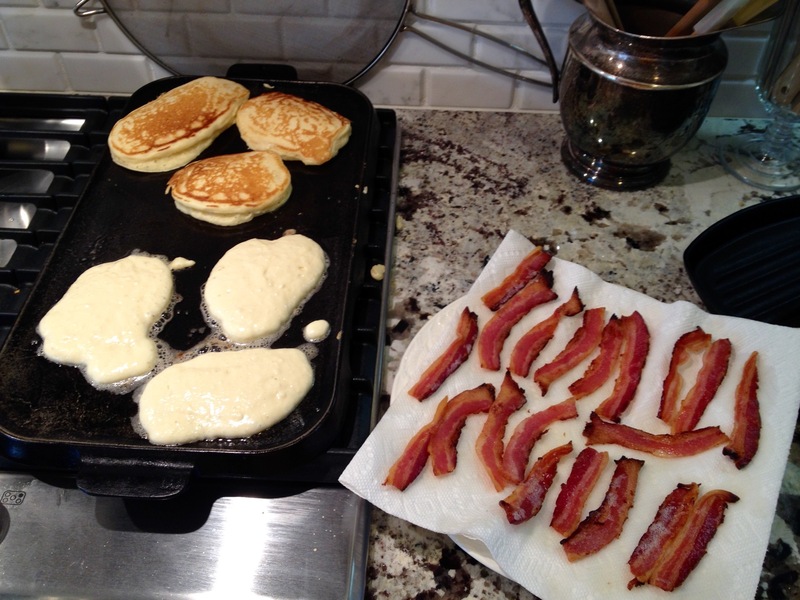 Just imagine of all the things you can do with your very own homemade bacon. Curing isn’t anything to be afraid of. Curing salt is simply a mixture of sodium nitrite and regular old table salt. Prague Powder #1 happens to be 6% sodium nitrite and 94% regular salt and is the only type of cure you need to worry about. There is such thing as Prague Powder #2, but it contains a different ratio of ingredients and is for a completely different style of curing. What is sodium nitrite? 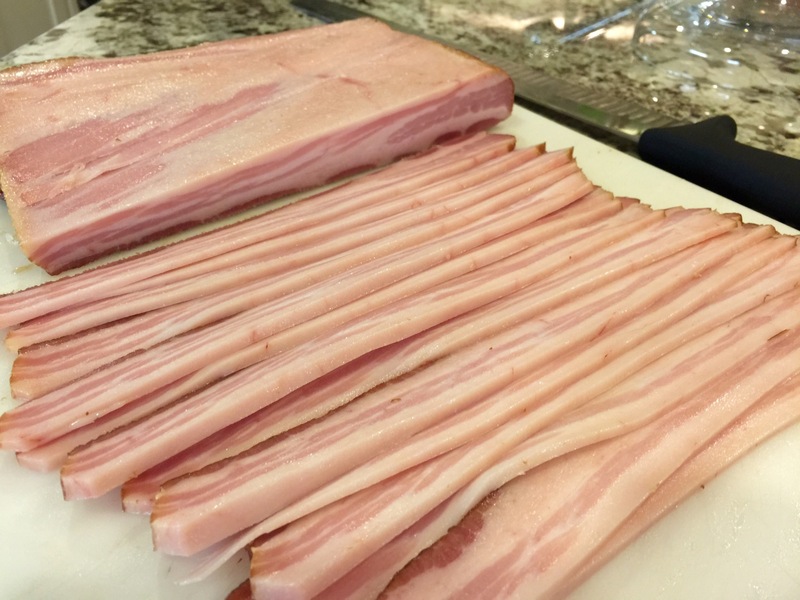 It’s a common ingredient needed in the creation of all types of meats we know and love such as ham, pastrami, sausages, and of course bacon. So here’s the deal. Curing requires a very specific curing-salt-to-meat ratio. Too much results in excess sodium nitrite which isn’t good for you, and too little could result in spoiled meat which is just gross. The rule is always one teaspoon of Prague Powder #1 per five pounds of meat, ground or otherwise. Easy. It’s printed right there on the container of curing salt. It gets very complicated when you start adding liquids because then you need to calculate the solution, weigh the ingredients, blah blah etc etc. If you search around the interwebs a bit you will find all sorts of opinionated rednecks arguing with one another about science and math in a very amusing manner. You will also find quite a lot of recipes that call for wildly incorrect amounts of curing salt, which is a little scary. The good news about this particular recipe is that it’s very safe. We already know that we’re not using too much curing salt.. but what if there isn’t enough? Well even if you didn’t use any curing salt at all, the meat is refrigerated throughout the process and only “ages” for 7 days, which isn’t really enough time for it to spoil. There’s also copious amounts of regular old salt – an effective preservative – and the meat actually ends up getting cooked twice before it ever comes near your plate anyway. There, does that make you feel better? I thought so. Let’s get started then! You don’t need a lot of gear to cure your own bacon. The first thing you need to do is locate five pounds of skin-on pork belly. You should be able to order one at the butcher counter in your local grocery store. Alternately, you can seek out a specialty butcher shop and see if they already have pork belly in the display case. My favorite haunt for this sort of thing is Schaub’s Meat, Fish, & Poultry in Palo Alto. They usually get their deliveries of pork on Thursday mornings, so if you’re quick about things you can often snag a hunk of belly that same day without calling ahead. Whisking together the dry mix first helps ensure an even distribution of curing salt. 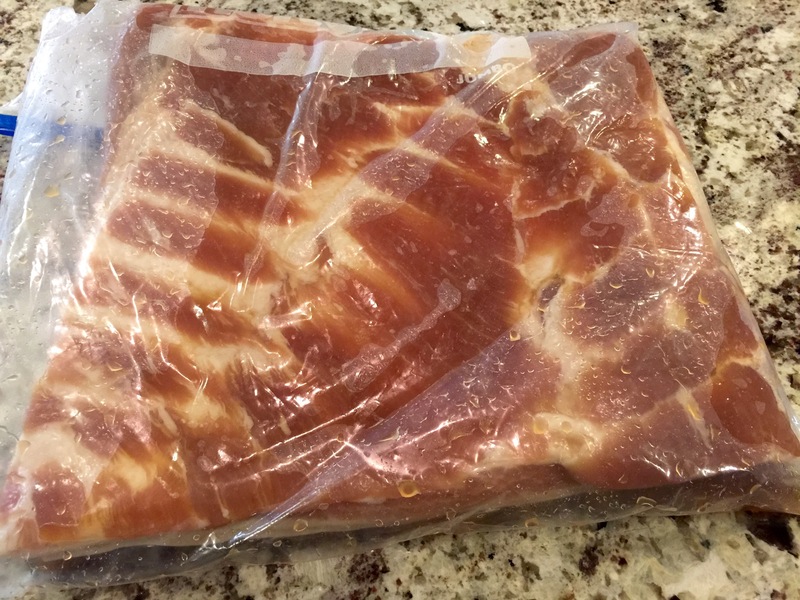 Rinse the pork belly with cold water, pat dry with paper towels, and put it in that 2.5 gallon Jumbo Ziplock bag you set aside. 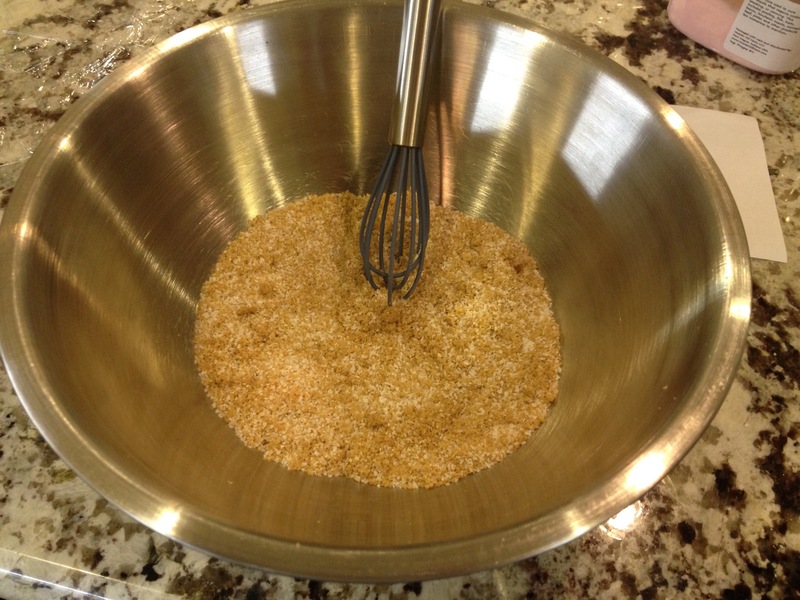 The next thing you want to do is whisk together all of the dry ingredients in a small bowl. Note that Kosher salt measures differently than table salt does. A good general rule is that you should double the measure when using Kosher instead of table salt or halve it when going the other way. If you want your bacon a little on the salty side, allow the measuring cup to heap a little bit, otherwise make sure it’s a level scoop. 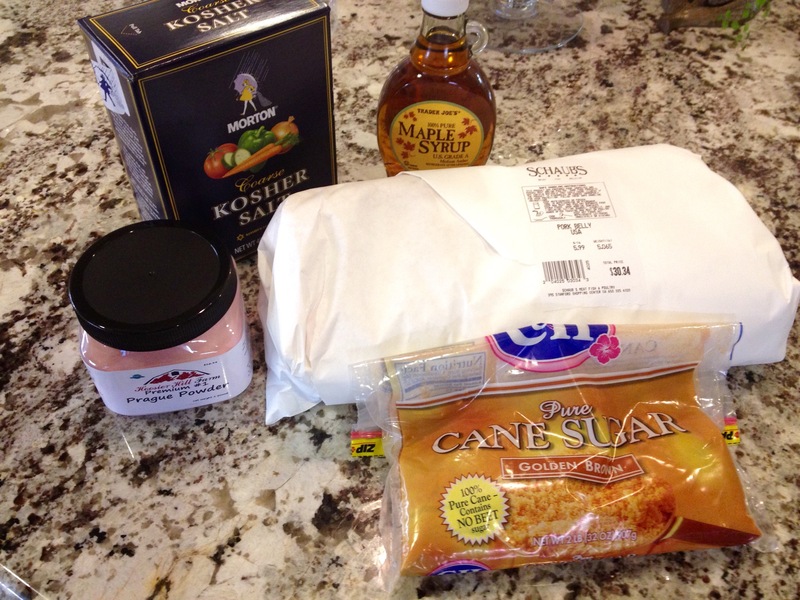 Dump the dry ingredients into the Ziplock bag right onto the belly and add the 1/4 cup maple syrup as well. Belly in a bag. Here we go. Seal the zip on the bag and smoosh the ingredients around until the belly is completely covered. You might be thinking that it’s a pain to try and rub the ingredients on inside the bag, and you would be correct. You might also think it would be a better idea to apply the rub before putting the belly in the bag and you would be wrong. Remember that it’s important to apply exactly the correct amount of cure to the meat; if we rub the cure on first, we’re going to lose a good amount on our hands and on our working surface, meaning the bacon will turn out under-cured. Applying the rub inside the bag also helps ensure the correct saltiness (and maple-y-ness) of the finished product. It only takes an extra minute or two, so stop complaining and get to work. Once the belly is covered, lay it flat in the refrigerator and let the cure do its thing. Every day or two, flip the belly over and give it a pat and a rub to help make sure the cure is distributed evenly. After a week of quality fridge time it should look about like this. Your bacon is now officially cured, but we still have some work to do. Remove the cured belly from the Ziplock bag, rinse it thoroughly, and pat it dry with a paper towel. Some people recommend letting it hang dry in the fridge for as long as two or three days in order to form a magical barrier-like thing called a pellicle that somehow simultaneously holds in juices, allows for even cooking, and makes smoke flavor “soak in better”. Gently warming your cured belly in a 100 degree oven for an hour is supposed to do the same thing. I have never beheld the forming of this mystical meat coating myself, but I’m not about to argue with an entire Internet full of other self-titled experts who say it’s for real. 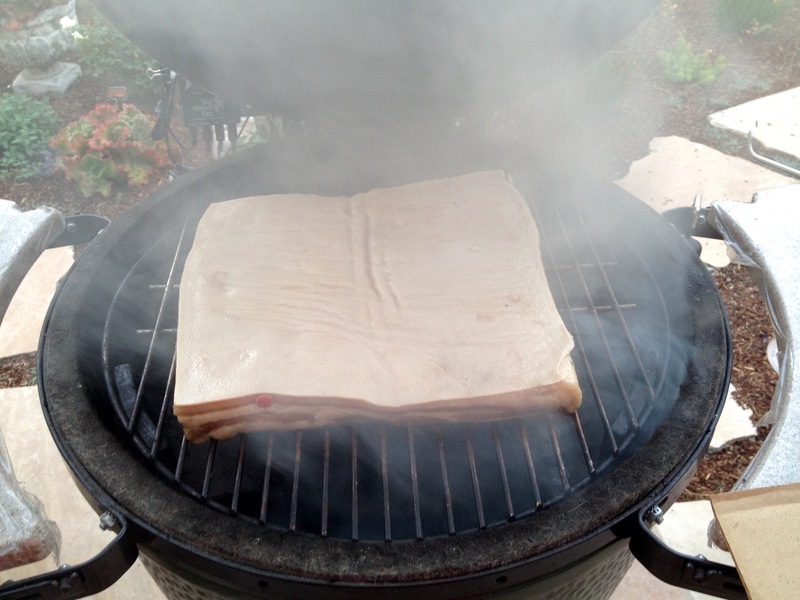 Personally I don’t bother with pellicle summoning (or whatever the activity is called), and my bacon still rocks. Do it if you feel it’s a worthwhile step, otherwise don’t. Your call. This little piggy went to the smoker. This next step is where the meat thermometer comes in. What we want to do is cook the belly, as slowly as possible, until the internal temperature reaches 150 degrees F. If you have a smoker, great. Set the temperature to 200 degrees F (or as close as you can get it), throw some applewood chunks or chips onto the fire, and put the cured belly skin side up on the grill for two or three hours. If you don’t have a smoker but you do have a regular charcoal or gas barbecue, configure it for low, indirect heat, and it will do just fine for smoking the cured belly. The different methods and techniques for configuring regular barbecues for indirect heat is a whole other can of worms that I won’t cover here, but I will say that there are plenty of options available to you. A regular old oven will work just fine as well, and you can still add smoke flavor by introducing a little liquid smoke to the process. Yes, it does smell as amazing as it looks. Be jealous. Once the belly reaches an internal temperature of 150 to 155 degrees F, remove it from the smoker/grill/oven and allow it to cool. Remove the skin while it’s still warm and stick it in the freezer for later use. That salty, smoky pig skin has all sorts of fabulous uses (e.g., chitlins, flavoring soups and beans, etc.) so definitely don’t just throw it away. What you do from here is now completely up to you. You can slice your bacon, cut it into chunks and give it away to friends, freeze it, chop it into bits and make lardons, use it as a pillow, etc. In my opinion, the very best option is to slice some of it up and make BLT sandwiches for dinner while you decide what to do with the rest. There are no bounds to what you and your bacon can accomplish together. A 14″ brisket knife and a steady hand make for nice, even strips. Now that you know how to cure your own bacon, you can start messing with the recipe a bit. Just remember that it’s always one teaspoon of Prague Powder #1 to five pounds of belly in a dry (or mostly dry) mix. From there do whatever you like. Add spices, pepper, bay leaves, espresso… pretty much anything really. Get out there and conquer your own world of bacon. 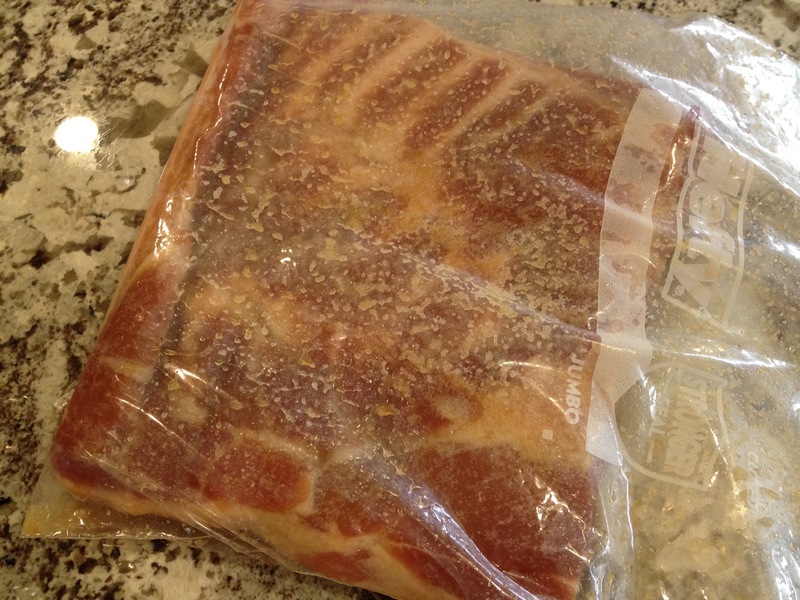 Rinse pork belly with cold water, pat dry with paper towels, and place in Jumbo Ziplock bag. Whisk together dry ingredients, stir in maple syrup, and add to bag. Seal zip on bag and work cure mixture around until entire belly is covered. Place in refrigerator for at least 7 days, flip daily. Remove belly from bag and thoroughly rinse in cold water. 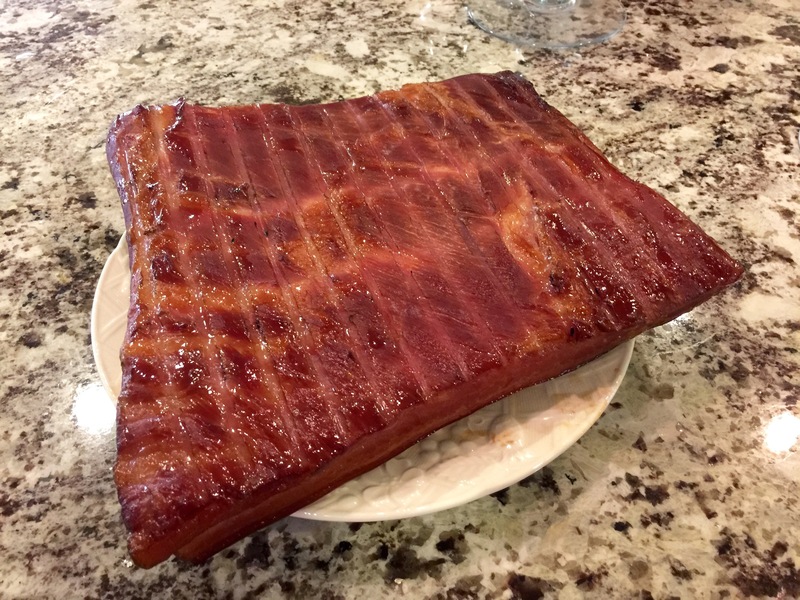 Smoke at 200 degrees F until internal temperature of belly reaches 150 to 155 degrees F. Remove skin while warm, cut bacon into slices and refrigerate or freeze. You Can Make Bacon At Home. And It’s Delicious. I don’t come up with a lot of my own recipes (unless you count my own personal milk-to-Grape-Nuts ratio), and chances are the recipe posted above belongs to or was inspired by a person other than me. So if you’re wondering whether or not I ripped somebody off, I probably did. Don’t get out the pitchforks and torches just yet though! I want to make absolutely sure I give credit where it’s due, so if you think someone deserves recognition for something that I haven’t already called out FOR CRYING OUT LOUD LET ME KNOW. Thanks, I appreciate it. Here’s a cookie.